Send feedback on this video, or request new performance analysis videos. AppLaunch – Contains presets in a view that is geared for app launch analysis. XAMLApplicationAnalysis – Contains all the presets and views necessary to get started with analyzing your XAML-based Windows Store app. 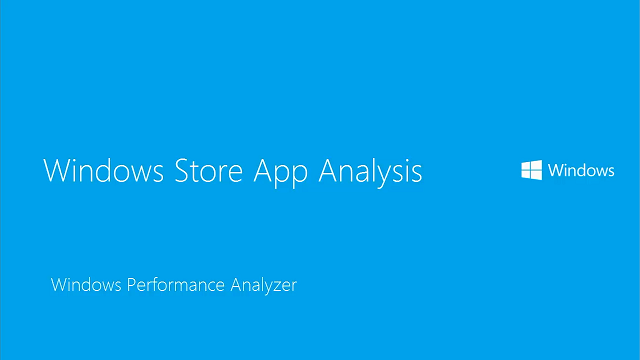 HTMLApplicationAnalysis – Contains all the presets and views necessary to get started with analyzing your HTML-based Windows Store app. For more information about profiles, see View Profiles. If you hover over the bars in the graph, you can see additional metadata for the corresponding activity. The Attributed CPU Usage table relies on regions of interest definitions to attribute CPU usage to different activities. When you use multiple regions files, different regions of interest can overlap and conflict. When these conflicts occur, WPA is unable to accurately attribute a single activity to a given thread in a given time range. To avoid these potential conflicts, use only one region definition file at a time. Windows Store apps use different threads to do different types of work. For example, the XAML UI thread passes work to the render thread to draw to the screen. WPA uses descriptive thread names to clearly identify what the thread is doing. Knowing which of the many threads in your table is the render thread and which is the XAML UI thread allows you to look for particular patterns of behavior, especially between threads. The image above shows activity from the XAML UI thread, the XAML Render thread, and the Desktop Window Manager (DWM) thread.